Where are you? 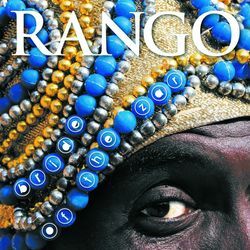 Home > Reviews > Rango - "Bride of The Zar"
"Bride of the Zar" is the debut album from mystical North African ensemble Rango. Led by Hassan Bergamon, the last surviving player of the ancient rango xylophone, this Cairo-based band of Sudanese and Egyptian musicians play a mix of ceremonial healing Zar music, hip-quaking Nubian wedding melodies, soldiers' marching chants, songs of love, songs of depression, songs of joy and tales of the mischievous Lady Racosha and the blood-sucking Spirit King, Master Manjoo. "No chickens were harmed during the making of this album and no entities from alternate dimensions manifested during the recording process"
Hassan plays a 19- year old rango xylophone with gourd resonators that are supposed to channel the spirits (for the full story of the discovery of Hassan and the extremely rare rango see under www.worldmusic.co.uk/rango). The ensemble also uses the simsimiyya and tanbura lyres, shakers made from recycled aerosol cans, a mangor belt (made from goats' toe-nails) and the percussion instrument: keria - a block of railway line! The instruments might be ancient or made from junk, but the musicianship (under the direction of Zakaria Ibrahim) is masterly and the whole album beautifully produced by Michael Whitewood of 30ips. Recommended.